Yes, that's right, there is mashed potato in those! Actually I wasn't that surprised when I saw it in the recipe as I've seen other confectionery recipes calling for mash, a truffle recipe if my memory serves me correct. This is of course potatoes not cooked in salt and mashed without milk or butter added, it's not that mad! I had asked K what he really misses and if there was anything I could 'veganize' for him and he immediately chose the dark chocolate bounty bar, or mounds to those of you in North America. I had a look online and there were recipes calling for cream and butter which would need replacing but this recipe was vegan. I have gotten it from a couple sources, first it comes from the Is that my bureka? blog where he made a fantastic looking lime coconut fudge, but the idea to use that recipe to make homemade bounty bars came from the dinner for one blog. As I scaled this down and made a couple changes I'll post my version here but do go look at those blogs for great step by step photos. I didn't add the lime as I wanted to recreate the bounty bars but am thinking lime in these would be amazing....will do that next time. 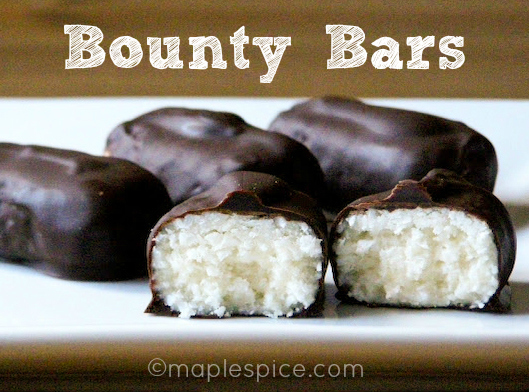 Oh, and yes, they taste just like bounty bars!!! Peel and quarter the potato and boil in unsalted water until ready to mash. Drain and return to the pan on low heat for a couple minutes to dry out slightly. Mash well and let cool. Strain the mashed potato through a fine sieve, pushing it through with a rubber spatula - you don't want any chunks at all in this. Measure out 2 Tbsp of this and place in a bowl. Add the vanilla and about 1/4 cup of the icing sugar and stir well. At this point it gets all scientific and the sugar turns the potato to liquid. I don't know why, I should really look that up! But it's a cool thing to see... then keep adding the icing sugar, 1/4 cup at a time until the mixture turns whiter and thick and fondanty. Stir in the coconut. Now you should have a ball of mixture that's hard to stir, if not add more icing sugar or coconut as need be. Now in hindsight I could have added less as the texture of a bounty bar isn't quite as dense as mine turned out. The original recipe was for fudge after all, so just keep an eye on it, think of the texture of a bounty and base it on that. 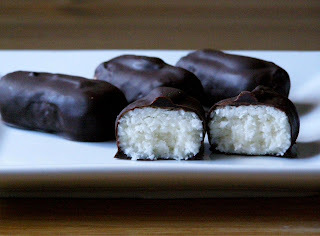 When I was happy with it I then greased my hands slightly with the coconut oil and started shaping them into little mounds and placed them on a baking paper lined baking sheet. When done, place in the fridge till cool and set. For the coating, place the dark chocolate and coconut oil in a bowl set over a pan of simmering water and stir until all melted and glossy. Take the coconut mounds and dip in the chocolate, covering all over and place back on the tray. When all coated pop them back into the fridge until the chocolate sets. Keep in the fridge, but really, they won't last long! Hi, we have been looking forward to, and are making your recipe right now. It seems that it took only 1/4 of a medium-large potato to produce 2TB of mashed potato. Is this all that is needed for 11 pieces? As I don't know what a Bounty Bar is, can you please let me know the correct size. Yours look a lot bigger than ours, and I'm wondering if we used enough potato. Also, is the coconut better in strings or chopped into powder? Hope it works out for you - they really were delicious! The recipe only calls for 2 Tablespoons of mashed potato, so just use that, don't worry about the size of potato as mine could have been a lot smaller. As for the coconut, I used dried dessicated coconut. As long as it is the same texture as dessicated it should be fine. Hope that helps a bit and that they work out for you, if you have any more questions feel free to ask!! Thanks a lot for the details. I thought it was more like a cookie/cake than a candy, which is why I expected (wanted!!) them to be bigger. I'll let you know how they turn out. The results are in, and they were great! As my partner prefers a smoother texture, we ground the dried coconut in the food processor before mixing with potato. We will be making them again (I'm afraid to know how many calories they have though)! Thank you, too. We made only 10...Any suggestions to make them lower calorie, so I can eat more of them? Vegan Sweetie - hope you get a chance to try them! hi!! congrats for blog :) sorry i dont speak english very well. These were absolutely delicious, 10 out of 10, just a shame confectionery manufacturers don't make sweets for Vegans, would be nice to able to buy them in a regular shop, but I enjoyed making them and of course eating them! If you flavoured these with raspberry, would they be a bit like coconut ice? Would it work as truffles without the chocolate coating?